often excelled in ― basketball, baseball, wrestling, soccer, track and, of course, football, the most popular of all. 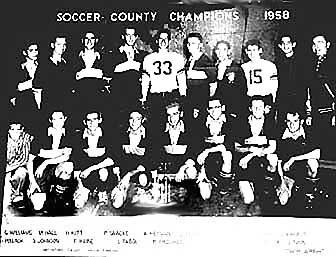 Most notable among our teams' athletic achievements during our time at OHS were the three county championships won in the 1958-'59 school year ― in soccer, basketball and baseball, and in our senior year, the 1959-'60 season, our undefeated Division I championship outdoor track team. We were all proud of those championship Sailors teams on which, as juniors or seniors, many of our classmates competed. Say! What? That's what! What's what? That's what they all say! Fifteen yells for the whole darn team. Rah, rah, rah, rah, rah; team, team, team! Come on Team, let's go. We're gonna fight, we're gonna fight, we're gonna fight. 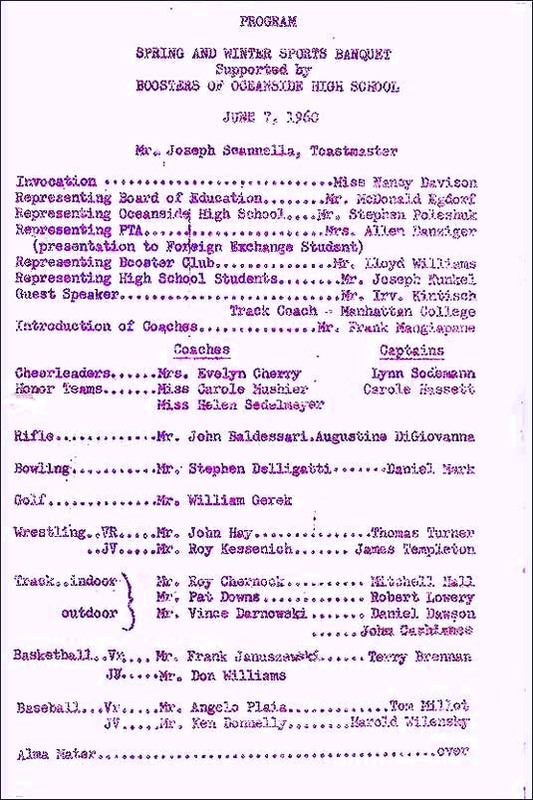 from our junior year (October 26, 1958) with the names of the players ─ and the cheerleaders!! In addition to cheerleading, modern dance and drill team, OHS offered a wide variety of athletic team programs for our girls, including tennis and badminton, field hockey, bowling, archery, volleyball, lacrosse, basketball, softball and the very popular and fondly remembered annual girls' "SportNite" competition. 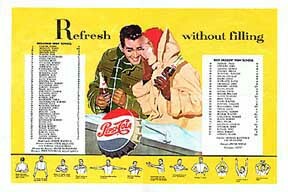 Not bad for the 1950s! 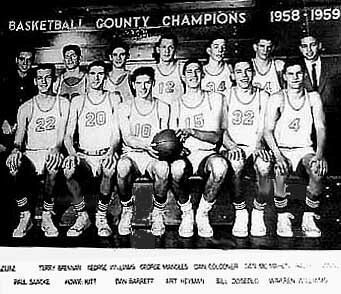 As noted above, during the 1958-'59 season (our junior year), our boys won three county championships, in soccer, basketball and baseball. The late Art Heyman ('59) shoots in overtime in the 1959 season. 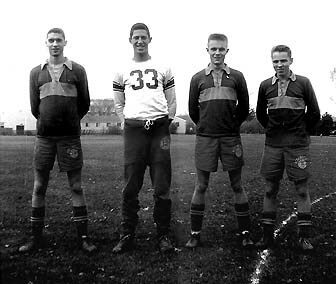 Our 1959-'60 season outdoor track team at left in a photo that appeared in our Spindrift featured record-breaking cross-country runner, the now late Steve Killorin (below, at right), and many other classmates of ours. But what our Spindrift did not tell us was that this team went 15-0 and thus became the first undefeated OHS track team in history and the 1960 Division I champions. Another source of pride for our class. Remember those old mimeograph sheets with the purple print that we used to like to sniff? Click here for selected clippings from the sports section of . 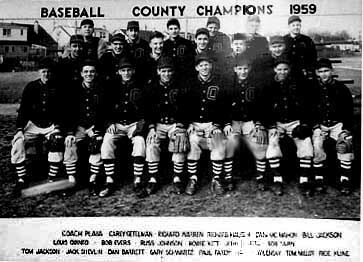 The first annual "Circle of Pride" dinner and induction ceremony honoring great OHS coaches and athletes and benefiting the OHS Athletic Hall of Fame, conceived in 1960 by none other than Coach Jan (Frank Januszewski), was held in our home town on June 12, 2003. 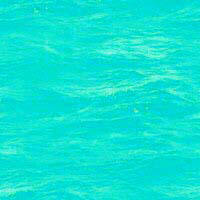 Copyright © 2000-2008, 2013 by Howard B. Levy and 1960 Sailors Association Inc. All rights reserved.